So if you know me personally you know that I love to scrapbook. I have scrapbooks of Kyle and I’s dating years, high school, engagement photos, wedding, honeymoon, first Christmas, 1st year, our house being built, and now our 3 year photos/pregnancy professional pics. Whew! 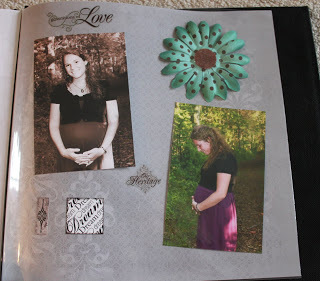 I am also in the process of a scrapbook documenting my whole pregnancy and I’ve started a baby book for Abigail. I guess I do love scrap-booking! 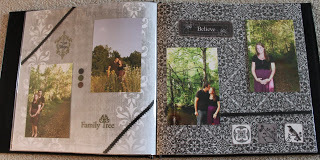 Well I wanted to show some of my latest scrapbook in this blog. 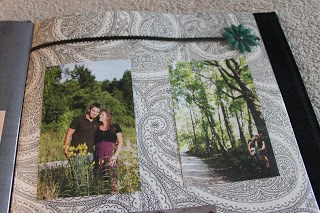 Maybe it’ll give some of you hesitant scrap-bookers ideas to do your own! For this one I had found a scrapbook from a long time ago that had nothing really done to it so I made it our 3 year book. It’s just a black leather one. If anyone has any ideas for the outside I would like to know cause it does seem kind of plain! Here’s a page I really like. Love these…it’s amazing what some ribbon can do! I was 29 weeks pregnant. I love the woods…great nearby park. – Pick a theme for your book (wedding, full year, k-12 for kids, etc). If you just mash a bunch of pictures together you’ll get frustrated and it’ll look strange if there’s no theme to it. – Buy half-off! Hobby Lobby especially has half-off their scrap-booking supplies about every-other week. –Buy a scrap-booking kit. 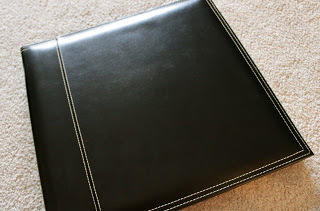 You can spend less money on a scrapbook that comes with paper, stickers, die-cuts, ribbon, etc. If you buy from Hobby Lobby at their half-off then you can get one for $15 or possibly less. That’s a great deal and that’ll help you have enough stuff and stay organized. – Stock up. When you see clearance stickers or stamps buy them cause the more stuff you have in your collection the easier it is to whip something up and not go looking for it when it’s time and spend full price.